A trail of oxidizer streams behind the SpaceShipTwo rocket plane during Friday's gliding test flight. Virgin Galactic's SpaceShipTwo rocket plane successfully glided through a test on Friday that sent oxidizer flowing through its engine — a sight that led observers to speculate that the suborbital spacecraft's first powered flight could be imminent. 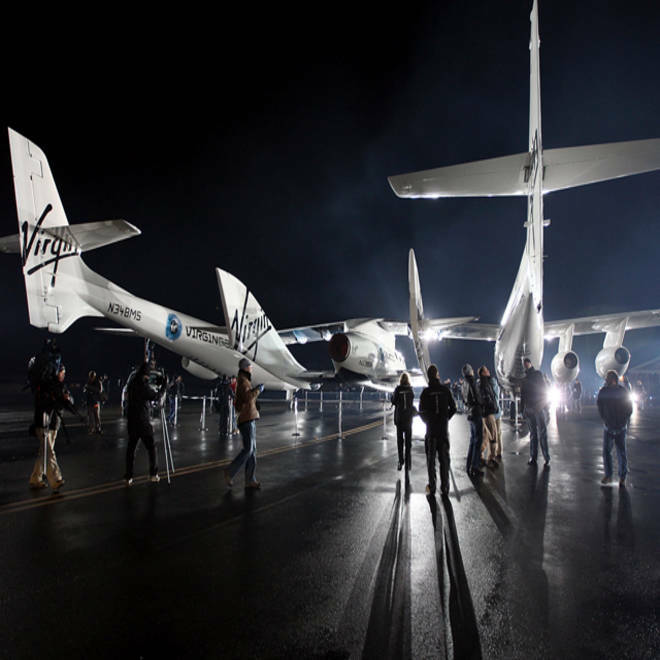 SpaceShipTwo has been tested in the air for more than three years. Its hybrid rocket engine has undergone extensive development and testing, including multiple test firings on the ground. But the rocket has not yet been lit up in flight — and that's a crucial step in Virgin Galactic's plan to put tourists in outer space. Based on rumblings coming from Mojave, Calif., where Virgin Galactic and Scaled Composites have been testing the six-passenger plane, the first powered test flight could come on April 22. Virgin's British billionaire founder, Richard Branson, hinted that something big was coming in a weekend blog posting: "I look forward to seeing you all in Mojave soon," he wrote. During Friday's test, Virgin Galactic's massive WhiteKnightTwo carrier plane took off from the Mojave Air and Space Port, carrying SpaceShipTwo under its belly. The mothership rose to an altitude of about 50,000 feet, then released the rocket plane for a 10.8-minute-long gliding descent back to the runway. Mark Stucky and Mike Alsbury were the test pilots for what was characterized as a "mission rehearsal" for the first rocket-powered flight. Virgin Galactic said SpaceShipOne successfully went through every step in preparation for that milestone flight, "apart from actually igniting the rocket." "Importantly, and for the first time in the air, oxidizer was flowed through the propulsion system and out through the nozzle at the rear of the vehicle — thus successfully accomplishing the 'Cold-Flow' procedure," the company said in a news release. "As well as providing further qualifying evidence that the rocket system is flight-ready, the test also provided a stunning spectacle due to the oxidizer contrail, and for the first time gave a taste of what SpaceShipTwo will look like as it powers to space." Virgin Galactic hasn't announced when the first powered flight would come. "We have to do a full review of the data before we finalize our next flight milestone, but we’re getting close now," the company's CEO and president, George T. Whitesides, was quoted as saying on the Space Coalition blog. April 22 has been the focus of speculation because that would be the 69th birthday of the late millionaire adventurer Steve Fossett, who became the first person to make a nonstop solo flight around the world in 2005. That trip was financed by Branson, a friend and fellow flight enthusiast, and was accomplished with a Virgin GlobalFlyer airplane that looked like a lighter version of WhiteKnightTwo. "Flying the space plane under power on his birthday would be a poignant tribute to Fossett, who died in a plane crash in California’s Sierra Nevada mountains two years after making his solo around-the-world flight," Parabolic Arc's Doug Messier wrote. Citing personal sources, independent consultant Charles Lurio also said April 22 was a target date. The first powered flight would represent the biggest step yet in SpaceShipTwo's development effort, which builds upon the history-making suborbital space missions that were flown by the SpaceShipOne rocket plane in 2004. Virgin Galactic's plan calls for an increasingly ambitious series of flights from Mojave that will eventually take SpaceShipTwo's test pilots beyond 100 kilometers (62 miles) in altitude, which is the internationally accepted boundary of outer space. As soon as next year, paying passengers may get their turn to climb aboard SpaceShipTwo at Spaceport America in New Mexico. The aerial launch from WhiteKnightTwo would lift them up to take a look at the curving Earth and the black sky of space. There'd be a few minutes of free-floating weightlessness at the top of the ride. Then SpaceShipTwo's innovative folding-wing design would slow down the supersonic plunge back toward Earth. The outer-space trip would end with a glide back to Spaceport America's 2-mile-long (3.2-kilometer-long) runway. Virgin Galactic says more than 500 people have signed up for the $200,000 suborbital space tour.